If you live in the Kitchener-Waterloo area, you’ve undoubtedly seen the rise of trendy coffee shops, local breweries and health conscious cafes. Goodvibes Juice Co. is one of the companies nestled in the heart of this region and they have a strong message to share. Their logo is the Flower of Life, an ancient symbol found across the world. It is tied to energy, oneness with all and balance, which are reflected well in the brand’s promise. Drew Butterworth, the founder of Goodvibes Juice Co., is committed to the company and its vision. “We try to offer products and services that save you time and energy so you can reinvest that time and energy exercising, or spending with family and friends and growing more balanced in the process,” Butterworth said. What’s special about the company is that it was ultimately birthed from a commitment to follow a passion. Despite his success, Butterworth wasn’t necessarily inspired by money to begin his venture. “As much as I want to have success and do well and have freedom, I don’t really believe in money for what it currently is. I would have really been mad at myself if I woke up, was 60 and just worked for a pay-check my entire life … Although I do want wealth, really I just want wealth so I can have freedom,” Butterworth said. Each bottle Goodvibes serves is made from glass. That way, there’s no chance of chemically contaminated plastic infiltrating your delicious juice. This also allows the company to use a loyalty return program with the bottles, reducing their ecological footprint. If you’re looking for Goodvibes Juice Co., they’re located in the Walper Hotel at 1 King Street West Kitchener, as well as 120 King Street South, uptown Waterloo inside the gym Hustl & Flow. With two to three pounds of raw, fresh produce going into every bottle, Goodvibes delivers on their promise to help people achieve balance in their lives. “So they’re putting something into them that they can feel good about, that they’re not going to be able to go out to the grocery store and get. You know they could go out and buy the stuff and juice it themselves, but that takes a lot of time and energy and the cleanup,” Butterworth said. It’s an easy grab-and-go option when you’re travelling back home, spending a day uptown or if you’re busy with classes and need to fit in some extra nutrients. A personal favourite juice of mine that Goodvibes offers is the Majestic. It gets its rich colour from blue-green algae and the vibrant taste makes my body feel alert, hydrated and ready for the day. If sea nutrients aren’t your thing, don’t worry, they have tons of choices. 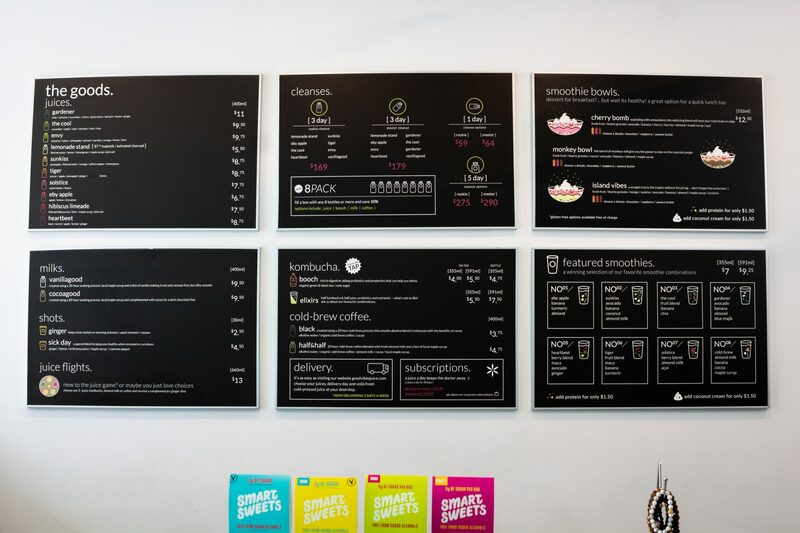 At first, they began with simple, cold-pressed juice, but Goodvibes has quickly expanded with lemonades, smoothie bowls, milks, coffees, kombucha and ginger shots careful with these guys — they’re great for your digestion but their heat packs a punch. With the summer coming up, Goodvibes is prepared to help their customers level up with a fresh juice cleanse. They offer one, three and five day cleanses to help your body flush itself of toxins and you brighten up for the sunny months. Their juices can also be found at many other locations across the KW region, including Vincenzo’s grocery, DVLB, Smile Tiger and Legacy Greens. If you haven’t discovered Goodvibes’ rainbow of colourful juices yet, this time of year is perfect to test one out. Grab one on the go for a late night study session, early morning or a lazy afternoon to pack your body with extra fruits and veggies to support a balanced lifestyle.